Please feel free to download, print and distribute! Recently, Physical Therapists have been seeking to incorporate what is being named "Dry Needling" into their patient treatment regimens. Dry Needling is indistinguishable from acupuncture, yet is often based on two or three day seminars, featuring only 16 to 24 hours of classroom education with no needle technique clinical internship training being included... Is Dry Needling the same as Acupuncture? “Yes,” according to all major state and national organizations. TO READ MORE, PLEASE CLICK ON IMAGE. 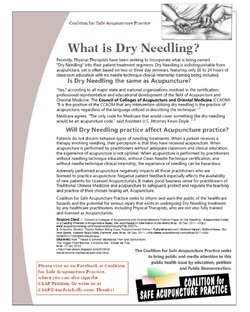 When is Dry Needling Acupuncture? 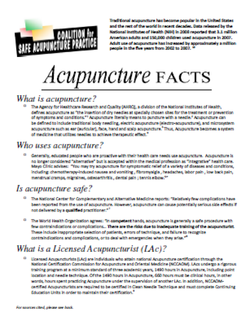 The Agency for Healthcare Research and Quality (AHRQ), a division of the National Institutes of Health, defines acupuncture as “the insertion of dry needles at specially chosen sites for the treatment or prevention of symptoms and conditions.”1 Acupuncture literally means to puncture with a needle.2 Acupuncture can be defined to include traditional body needling, electric acupuncture (electro-acupuncture), and microsystem acupuncture such as ear (auricular), face, hand and scalp acupuncture.3 Thus, Acupuncture becomes a system of medicine that utilizes needles to achieve therapeutic effect.